Mark Charan Newton was born and lives in Nottingham. He holds a degree in Environmental Science. After working in bookselling, he moved into editorial positions at imprints covering science fiction and fantasy. He has written for a variety of non-fiction publications including The Ecologist and The Huffington Post, as well as science fiction for BBC Radio 4. Find him at his website. Legends of the Red Sun — (2009-2012) Publisher: Political intrigue and dark violence converge in a superb new action series of enthralling fantasy. An ice age strikes a chain of islands, and thousands come to seek sanctuary at the gates of Villjamur: a city of ancient spires and bridges, a place where banshees wail the deceased, cultists use forgotten technology for their own gain and where, further out, the dead have been seen walking across the tundra.When the Emperor commits suicide, his elder daughter, Rika, is brought home to lead the Jamur Empire, but the sinister Chancellor plans to get rid of her and claim the throne for himself. Meanwhile a senior investigator in the city inquisition must solve the high-profile and savage murder of a city politician, whilst battling evils within his own life, and a handsome and serial womanizer manipulates his way into the imperial residence with a hidden agenda. When reports are received that tens of thousands of citizens are dying in a bizarre genocide on the northern islands of the Empire, members of the elite Night Guard are sent to investigate. It seems that, in this land under a red sun, the long winter is bringing more than just snow. Nights of Villjamur by Mark Newton is the first in a series entitled Legends of the Red Sun. The setting is the Boreal Archipelago, though the vast majority of the action takes place in the capital of the Jamur Empire — the eponymous city of Villjamur. The empire is built on its military and the remnants of ancient technology scavenged, studied, and used or modified (not always as the original technology was intended) by a group of Cultists (who are subdivided into sects). The city’s inhabitants are made up of humans, rumel, one member (Jurra) of an Ancient race who has seemingly lived for a thousand years but has no memory, banshees — women whose visions of about-to-happen deaths allows them to arrive immediately afterward to keen the announcement, and Garudas — half bird/half man soldiers/guards. I loved Nights of Villjamur. 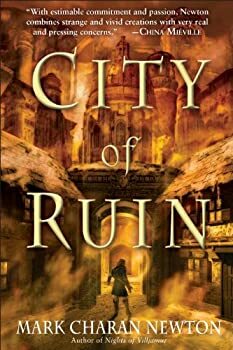 It’s one of the rare books I actually allotted five out of five stars, so City of Ruin was both highly anticipated and had quite a few expectations to live up to. It’s always hard for me to read a book I anticipate as much as I anticipated this one because the fear that it will fail miserably to live up to the hype seems to be doubled. 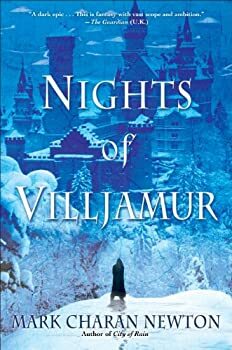 Nights of Villjamur was dark, sprawling, intense and ambiguous — all wrapped in a well measured, deftly written prose. It was an ambitious first novel. The real question(s) in my mind was: could Newton do it again? Could he manage another book without making everything I loved from Nights of Villjamur suffer in an effort to prove himself against heightened expectations? Drakenfeld — (2013-2014) Publisher: The monarchies of the Royal Vispasian Union have been bound together for two hundred years by laws maintained and enforced by the powerful Sun Chamber. As a result, nations have flourished but corruption, deprivation and murder will always find a way to thrive… Receiving news of his father’s death Sun Chamber Officer Lucan Drakenfeld is recalled home to the ancient city of Tryum and rapidly embroiled in a mystifying case. The King’s sister has been found brutally murdered – her beaten and bloody body discovered in a locked temple. With rumours of dark spirits and political assassination, Drakenfeld has his work cut out for him trying to separate superstition from certainty. His determination to find the killer quickly makes him a target as the underworld gangs of Tryum focus on this new threat to their power. 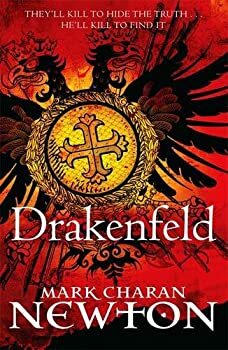 Embarking on the biggest and most complex investigation of his career, Drakenfeld soon realises the evidence is leading him towards a motive that could ultimately bring darkness to the whole continent. The fate of the nations is in his hands. Lucan Drakenfeld is a member of the Sun Chamber, the CSI unit of the Royal Vispasian Union. Drakenfeld is given a letter that tells him of the death of his father, and he must return to his home after ten years abroad. He and his partner, Leana, are soon tasked to investigate the murder of the sister of King Licintius of Tryum in what would prove to be the biggest case of Drakenfeld’s career, and he soon finds himself fighting off thugs and other unpleasant characters as the conspiracy unravels.